Yay! 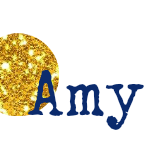 I’m finally back to participate in this month’s Fantastical Food Fight, hosted by Sarah at a Fantastical Sharing of recipes. I sat out the last two months, because a) graduate school started and I felt like I was running around like a headless chicken and b) the themes really weren’t in my wheelhouse. I love a challenge, but I’m just not into fruity desserts (the themes were cherry cobbler & peaches & cream). But this month, for National Ice Cream month, the theme is Ice Cream! Whoop! Dude was especially excited about this one, because he was eager to create a “mint ice cream like the store, mom” and add some peppermint patties. 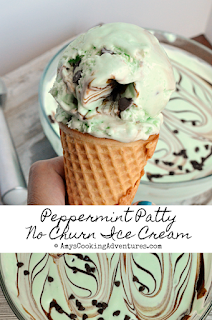 And I was pretty excited to try a no-churn ice cream since my ice cream maker (which wasn’t very good in the first place) when kaput as I made my Fresh Mint Chocolate Chip Ice cream earlier this month. “Ice cream like the store” means creamy (the first version was very crystalized due to ice cream maker issues) and minty, but not fresh mint minty, mint extract minty. Oh, and plenty of green food coloring. This recipe hits all those points. In fact, the no churn ice cream was amazingly smooth and creamy – it was fantastic – I can’t wait to try other flavors! And I have to admit, that while the recipe using fresh mint is cool and refreshing, this mint extract version will be our go-to recipe! Place the sweetened condensed milk, dye, extracts, and salt into a medium sized bowl and stir to mix. Place the heavy cream into the bowl of a stand mixer fitted with the whisk attachment and beat until stiff peaks form (do not overbeat, otherwise enjoy your butter). Alternately use a hand mixer or whisk. Place about one-fourth of the whipped cream into the bowl of the sweetened condensed milk and gently fold the mixture in. Slowly fold in the remaining whipped cream. Gently stir in the peppermint patties and chocolate chips. 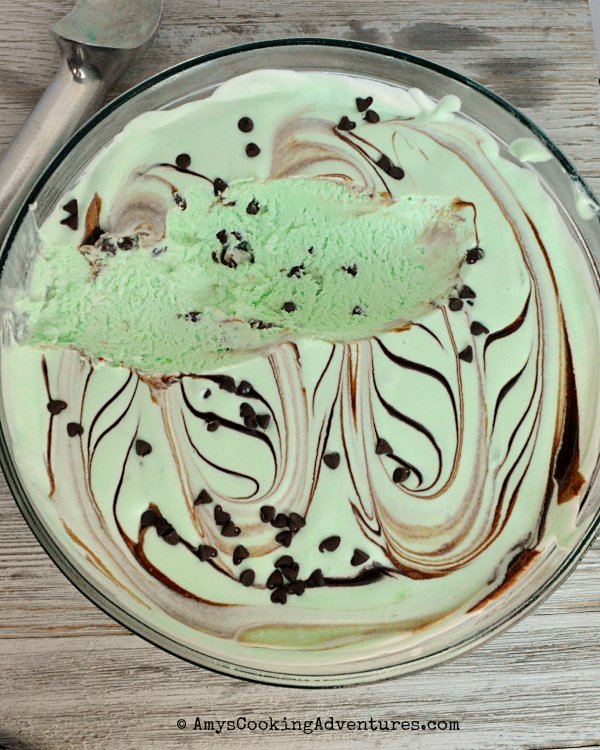 If desired, swirls chocolate sauce and additional chocolate chips on top of the ice cream mixture. Cover tightly and freeze overnight. 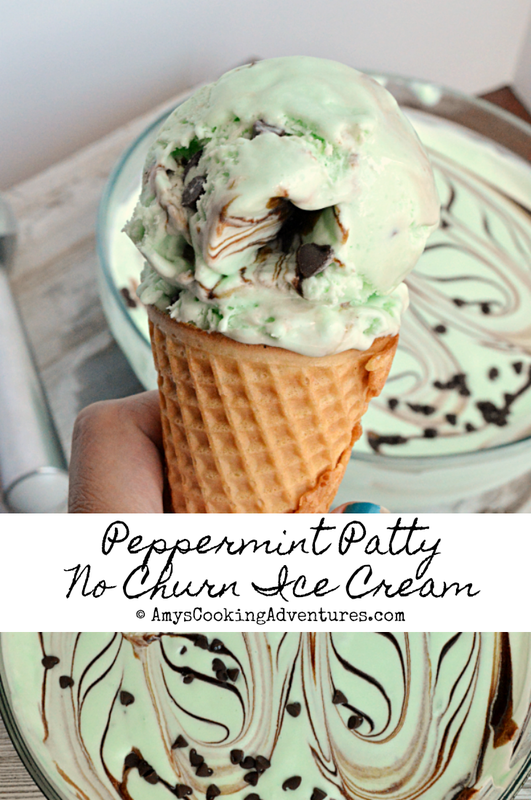 Peppermint Patty No Churn Ice Cream is extra creamy and perfectly refreshing on hot summer days! Place the sweetened condensed milk, dye, extracts, and salt into a medium sized bowl and stir to mix.Place the heavy cream into the bowl of a stand mixer fitted with the whisk attachment and beat until stiff peaks form (do not overbeat, otherwise enjoy your butter). Alternately use a hand mixer or whisk. Place about one-fourth of the whipped cream into the bowl of the sweetened condensed milk and gently fold the mixture in. Slowly fold in the remaining whipped cream.Gently stir in the peppermint patties and chocolate chips. If desired, swirls chocolate sauce and additional chocolate chips on top of the ice cream mixture. Cover tightly and freeze overnight. This sounds amazing! I'm thinking Junior Mints would be great here too. Now that I've jumped on the no-churn bandwagon, the possibilities are endless! Great looking ice cream Amy. Welcome back. No churn is amazingly easy, isn't it? Yours looks delicious! I might try it with some Junior Mints! Looks delicious! My kids would love this! Love the ombo loved the colour especially The chocolate swirls. Awesome!!! Great recipe - It's always good to find a family favorite. 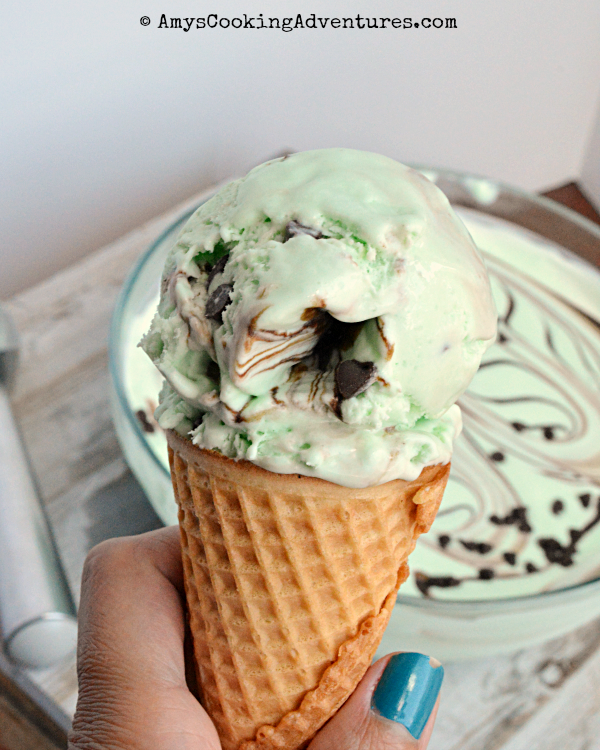 Love the colour of the ice cream and mint and chocolate is a family favourite.